It's been a part of Christophe Hisquin's daily routine to log on to all sorts of instant Web messengers and social networking sites. The French singer and MC has more than 500 friends on MSN, over 6,000 on My Space and over 13,000 followers on Sina Weibo, China's biggest microblog site. Although the 33-year-old hails from Lyon, most of his followers are actually Chinese. "Fans who appreciate my music, and students who like French culture, all can interact with me via the Internet," he said. Hisquin, who is also known by his stage name Dantès and Chinese name Dai Liang, is one of a growing number of expats with a passion for Chinese language and culture, who have taken a step further from merely observing or reading English translations to taking a more active part in Chinese Web activities. Having attracted a proper community of Chinese netizens that follow what they have to say, they post blogs in Chinese where they share their unique experiences living in the country and have conversations with Chinese people over topics concerning China; most of them are no strangers to Kaixin or Weibo (the Chinese versions of Facebook or Twitter). With the help of a few clicks, these expat bloggers have found a fresh way to connect to Chinese people. "If I wrote in English, most of my Chinese friends would only read a little and get tired. When I write in Chinese, they usually read everything I've written despite my mistakes, and often comment on my topics and correct my Chinese," Mark Powers told the Global Times. Powers is the founder of Little China World (www.littlechinaworld.com), a website that collects links to Chinese-language blogs kept by foreigners. "It's very exciting and I think foreigners are starting to pick up on this more," he added. When he started blogging in Chinese in 2006, Powers discovered that more Chinese people were willing to read what he had to say in Chinese than in English. Hoping to look for ways to let more people know about the efforts like-minded foreigners are making for their Chinese readers, Powers founded his website, Little China World. The website now has a list of over 40 blogs written in Chinese by foreigners. According to Powers, most of the international bloggers are of the young tech-savvy generation, who are fond of using all means of media like texts, pictures, or videos, to communicate with Chinese people. "There are some people who are older, but the average age leans towards 20," said the American, who is based in Shanghai. "If you are a foreigner who loves Chinese and wants to communicate with Chinese people, and maybe has something interesting to share, there's a huge potential for a fan base out there." Not surprisingly, a considerable amount of bloggers are people with an interest in making it big in the Chinese entertainment industry. "I hoped that through blogging, people would be able to learn more about me and I might do better in the show," Liam Bates, a Swiss national, who started blogging in 2009 right before he took part in a Chinese-language competition launched by Hunan Television Station, told the Global Times. According to Bates, after he appeared on the show, audience members looked for his name on the Internet and came across his blog, which gave him motivation to start writing more. "I went from about 10 visits a day to 1,000 over the course of a week," Bates said. "I think some people have stereotypes or ideas about you, without understanding fully what kind of person you are, what kind of ideas you really hold. Writing allows me to explain to people what I really think, without people basing an opinion on me after meeting me once or twice," David Spivey, a 25-year-old from the UK, told the Global Times. He is experimenting in doing comedy routines in Chinese to cater to the Chinese audiences. However, with modern life becoming more and more fast-paced, many of the bloggers have opted for quicker and easier means to reach their growing audiences. Powers agreed and said that he doesn't see people blogging as much as they used to in the past. Bates also concurred, adding that he doesn't interact much on his blog and uses Weibo more often now. 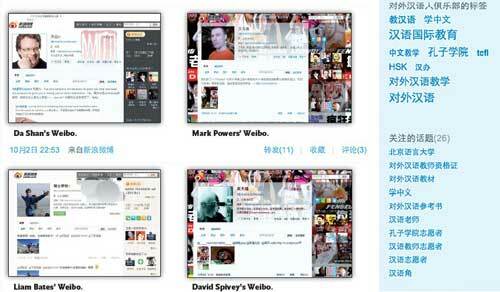 "I think Weibo is extremely useful and quite addictive at the same time," Spivey said, adding that although Weibo helps him catch up with Chinese friends more easily, he is skeptical when reading news that is spread on microblogging sites. For many of the bloggers, writing in Chinese serves as a good way to retain and develop their Chinese proficiency. "Using a language as often as possible definitely helps learners of a foreign language achieve a higher level of fluency, and should be encouraged," said Shao Jing, an associate professor at Shanghai International Studies University, who teaches Chinese as a second language. In addition, interacting with Chinese people directly also helps the bloggers achieve a better understanding of Chinese culture. "I believe that blogging in Chinese has allowed me to learn not only how to write better, but also has given me insight into how friends in China feel about certain issues," Brian Reynolds from Arizona, who keeps a blog under his Chinese name He Beilei, told the Global Times. Mark Powers agreed. He said once he was complaining about inflation in China, and completely out of his expectations, he got a lot of comments and feedback from Chinese people. "I really hit a nerve with that one," Powers said, adding that sometimes he gets people's sympathy and other times people will explain and ask him to change his attitude when he posts confusion and frustration about what he has encountered in China. Kevin McGeary, a copy editor for the Shenzhen Daily, who is also a commentator, translator and writer of Chinese songs, has kept a Chinese blog since August 2010. He said he's learned a lot about the subtleties of Chinese culture. "Chinese netizens are very good at creating euphemisms, most famously 'river crabs' and 'grass mud horse.' I have learned that Chinese people, although generally less confrontational, are no less likely to be opinionated," the 27-year-old from the UK said. Brian Reynolds, who has been blogging about issues including the differences in Chinese and American education, and being an African American in China, said his social circle of Chinese friends has also expanded thanks to his blog. "From rural migrant workers to housewives and business executives, I have readers from different parts of China leaving messages on my blog and expressing their views. This has exposed me to the diversity of China, which in turn encouraged me to begin my expedition around the country exploring China's minority cultures," Reynolds said, adding that he's also gained help from people who read his blog first. According to the latest census data released by the Shanghai Statistics Bureau last month, there are about 143,200 foreigners living in Shanghai. Foreigners integrating into Chinese society has hence become an issue that is getting more and more attention. Even for Chinese-speaking foreigners, it's not always easy. Christophe Hisquin said he believed it will get more and more difficult for foreigners to make a living in Shanghai, with less privileges given to foreigners as they become a more common sight. However, he recognized that speaking and writing in Chinese helps him turn into "an actor who becomes Chinese on demand." "Although deep down I am still every inch French, compared to those who are not so involved in Chinese culture and life, I realize I have become Chinese," said Hisquin, who has been learning Chinese since he was 11 years old, and has lived in China for the past eight years. Hisquin said there are still many misunderstandings that Chinese and foreigners have towards each other, the distinction between "Chinese" and "foreign" being one of them. "A lot of Chinese people make the distinction between China and the rest of the world. In fact, the distinction is more like China, the US, France, Spain and so on," he said. Kevin McGeary expressed a similar view. "I am always cautious about beginning a sentence with 'the Chinese,' because Chinese people are not any one thing," he said. Rarely do their blogs cover controversial issues. Instead, most of the bloggers aim for their blogs to serve as a platform to facilitate exchanges between people from different countries and cultures and serve as a contribution to cross-cultural communication. "When you put something on the Internet you never know whose imagination you will capture," McGeary told the Global Times. "Most of what I write is an attempt to start a conversation rather than offer a conclusion." This blog, written by an Australian girl called Sasha, is dedicated to newcomers to Shanghai. It covers everything from a Chinese hair salon adventure to a local sexpo expedition, from asking Chinese people for directions to finding accommodation in town. Full of light and playful banter, the stories this "sassy Aussie lassie" tells offer interesting insights. Will Boyd addresses classical Chinese philosophy in this blog, which he said, is his search for "masters around China who can explain the Chinese philosophy of life, the Chinese view of relationships, and ways in which people can understand and enter into the Chinese tradition." The American who was adopted by a Chinese family shares his experience of wading through Confucian texts, and his understanding of contemporary issues. Posting stories about her personal life, especially relationships with her Chinese husband and in-laws, American Jocelyn Eikenburg offers advice to people in cross-cultural families and dating dilemmas. Covering issues such as where foreign women can meet Chinese men, to how to integrate into a Chinese family, Eikenburg offers refreshing perspectives on the intricacies of intercultural relationships and her love of Chinese culture. With a focus on Chinese language learning, Niel de la Rouviere shares his obsession with Putonghua on this blog project. Tracking down his own learning levels, amid providing intriguing learning material, this "confused laowai," a linguophile and aspiring web entrepreneur based in South Africa, talks about topics such as the oddities in pinyin he's discovered, and entertaining options to learn Chinese. Serving as a guide to modern China, this blog gives readers a look into the "personal effects of the rapid changes" in China that go beyond statistics and figures. Blog keeper Tom, who's now based in Nanjing, offers tips on what to expect when moving to China, addresses issues from currency manipulation to the legacies of the Revolution of 1911, and shares his thoughts and experiences of life in China.